A wasteful Bulldogs team have turned around a 38point deficit, with a 13-2 goal second half. They had far more of the play, winning inside 50s (62-44), forward 50 marks (21-8) and shots at goal (45-20). Brisbane falling away in the final minutes of the game, have conceded five goals from the 22 minute mark of the final quarter. The Bulldogs have now kicked 12 of the last 14 goals, and generated 44 shots at goal, which is the most any team has had this season. After all their problems today with goal kicking, the Bulldogs have now kicked 5.0. (30) from set shots at goal in the final quarter. The Bulldogs have moved the ball well in the final quarter, with four of their five goals coming from chains started in the defensive half, and kicking efficiency in the forward half of 76 percent. A bad turnover by the Lions leads to a third goal for Dunkley, and the Bulldogs now have nine of the last 11 goals. The Lions lead in final quarter clearances (84), inside 50s (11-8), and have broken even in contested possessions, as they hang in this game. 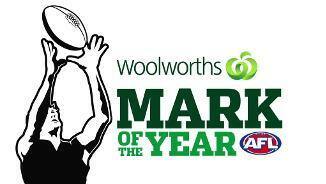 The Bulldogs take the lead following the 50 metre penalty against the Lions. Brisbane has conceded the most goals by any side from free kicks against this season (11). Dayne Zorko has been very dangerous up forward (or in the middle) for Brisbane. He has a gamehighs for score involvements (10), metres gained (620) and tackles (eight). Brisbane getting a good return from regular midfielders playing deep in the forward line with Rockliff, and now Zorko taking contested marks and kicking goals. The Lions lead 128 in one-on-one contest wins. Josh Dunkley has been handy forward for the Bulldogs today with seven score involvements (including two goals and two score launches), and has applied two forward 50 tackles. An important mark and goal from Tom Rockliff gives the Lions their first goal of the second half, and ends a streak of five goals to the Bulldogs. The wasteful Bulldogs still have a massive advantage in shots at goal 3416. This is the most shots at goal any team has had at three quarter time this season. A better quarter from the Bulldogs who won the contested possessions 3520, inside 50s 14-8 and shots at goal 10-1. However, they were again inaccurate returning just the four goals from this control. The Bulldogs have continued to not make the most of forward half intercepts. They have now scored 0.12. (12) from 32 such intercepts. Brisbane has scored 1.0. (6) from only four such intercepts. The Bulldogs defensive set up has been able to disrupt the Brisbane attacks this quarter, with a 62 advantage for intercept marks, and 17-12 lead for intercept possessions. The Western Bulldogs have scored 4.6. (30) from set shots at goal compared to Brisbane 2.0. (12), and now lead in forward 50 marks 135. The Bulldogs have used the ball far more efficiently this quarter with kicking efficiency of 84 percent (compared to Brisbane 60 percent). Four goals in a row to the Bulldogs now, and all three this quarter have come from stoppages as they get on top in this area. The Bulldogs lead in contested possessions (114), clearances (4-2) and inside 50s (6-1) to start the third quarter. 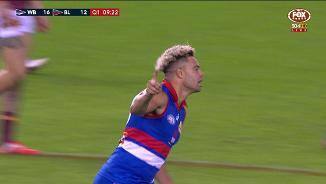 The Western Bulldogs get their first goal of the game from a forward 50 chain. They have had 11 such chains that have generated just 1.6.(12). Brisbane has one goal from one forward 50 chain. Unfortunately for the Bulldogs, they have started the third quarter with two more missed shots at goal, having generated the first four inside 50s of the quarter. Bulldogs InterchangeJosh Dunkley off due to an injury. 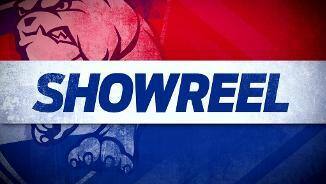 Bulldogs InterchangeMatthew Boyd off due to an injury. The 24 shots at goal generated by the Bulldogs is the most a team has had in the first half of a game this season. The Bulldogs lead in inside 50s (3220), forward 50 marks (11-4) and shots at goal (24-15). However, they have failed to score from seven shots at goal and returned 5.13. (43) from all of these opportunities. 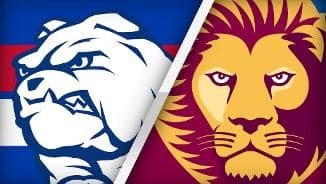 Brisbane has forward half kicking efficiency of 76 percent compared to the Bulldogs 54 percent, with this advantage providing both better scoring opportunities, and superior conversion. An amazing first half of football, with the super efficient Lions punishing the Western Bulldogs. From just 20 inside 50s, Brisbane has generated 15 shots at goal for a return of 12.3.(75). In the second quarter, the Lions have a lead in clearances 1411, but a massive advantage in effective kicks 49-24, with their efficient ball use setting up quality scoring opportunities. Lions InterchangeEric Hipwood off due to an injury. A bad minute for the Lions with Hipwood limping off the ground as a terrible turnover leads to a goal to Dunkley, ending a six goal streak for Brisbane. An amazing burst from the Lions who have four of the last five clearances, had five of the last six inside 50s and kicked four goals in this five minute burst. Brisbane has now kicked nine of the last ten goals in the game. 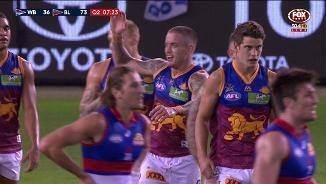 Mitch Robinson gets some reward for his good first half to give the Lions their biggest lead of the game. In the second quarter they have broken even in clearances and won contested possessions. Terrific play from Lewis Taylor and Ben Keays gives Brisbane its ninth goal from just 12 inside 50s, with all of the Lions goals this quarter coming from stoppages. The Bulldogs continue to dominate inside 50s (2511), and more importantly now lead in shots at goal 21-8, but continue to waste their opportunities. Brisbane now has eight goals from just 11 inside 50s. This season the Lions have scored a goal from 25 percent of inside 50s (ranked 12th). Mitch Robinson has made an excellent start for the Lions in all areas of the game, with gamehighs for tackles (four) and score involvements (five), to go with eight disposals at 100 percent efficiency. 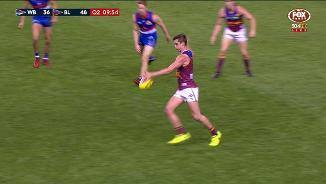 Tom Boyd with his first kick of the game ends the Brisbane run of goals. The Bulldogs have scored just 0.4. (4) from their 15 forward half intercepts, and average 32 points from 23 such intercepts this season. Four goals in a row to the Lions who seemingly can not miss early in this game. The Zorko goal was their first score to come from a stoppage. The Bulldogs have dominated the clearances (125), contested possessions (40-27) and inside 50s (17-6) in a fashion more like their 2016 output. The Lions have been able to pick holes in the Bulldogs defence on counter attack, with Eric Hipwood (three goals) and Hugh McCluggage (one goal and one goal assist) taking full toll. A strange first quarter, with the Bulldogs winning control of the play but wasting their opportunities. They had 16 shots at goal (the second most by a team in any quarter this season) but only converted three of these into goals. 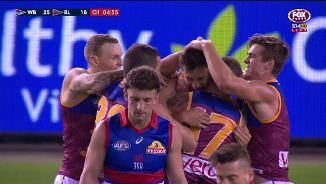 Brisbane take the lead with another rebound goal to punish a Bulldogs turnover. All five of the Lions goals have come from turnovers. Both teams have been able to easily generate shots at goal from their forward 50 entries. The Bulldogs have now had 15 shots at goal for a return of 3.7. (25) with five not registering a score. The Lions have 4.0. (24) from just five inside 50s. Excellent forward pressure from the Lions leads to a first career goal to Hugh McCluggage. Brisbane has generated 25 percent of its score from chains started in the forward 50 this season, which is the second highest percentage of all teams. 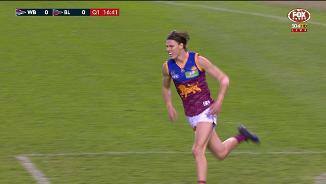 Brisbane (and Eric Hipwood) gets its third goal of the game, this time from a chain that started with the Daniel Rich kickin. Rich has taken 21 kick-ins this season, with 10 of these resulting in an inside 50 (a competition-high). 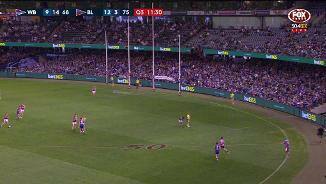 The Western Bulldogs are effectively trapping the ball in their half of the ground. They lead inside 50s 123 and have already generated four forward 50 intercepts. Three goals in a row now to the Bulldogs who lead in clearances (73) and contested possessions (20-9) in an ominous start to the game. 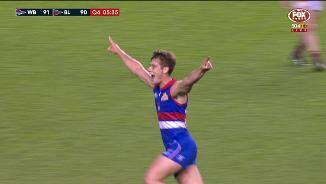 The Bulldogs have allowed its opposition to win five more centre bounce clearances per game this season (ranked last), but get their first goal of the game today from this source. An excellent kick from Daniel Rich to set up a second goal for Hipwood from just three inside 50s.. The Bulldogs have generated five shots at goal (for just two points) from six inside 50s. Brisbane has been a bit sloppy with its kicking early, registering seven clanger kicks (from just 14 total kicks). The Lions average 23 such kicks per game (the fourth most of all teams). The Bulldogs failed to register a score with the first three shots at goal of the game, before the Lions get the first goal, coming from a defensive 50 chain. They have averaged 13 points per game from this source (ranked 13th). The Lions win the opening centre bounce clearance of the game, but unable to convert this into a score. They have scored from just 19 percent of their clearances this season (ranked last). The Bulldogs have generated 13 percent of their score from defensive 50 chains this season (ranked first), while the Lions have allowed their opposition to generate a score from 15 percent of their defensive 50 chains this season (ranked last). 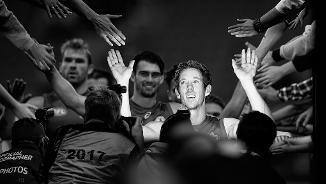 Just in case you missed it, Bob Murphy plays game number 300 for the Bulldogs today. Only Brent Harvey and Corey Enright have had more effective kicks than Murphy since he made his debut. A change in style for the Bulldogs this year. In 2016, the Bulldogs were ranked last for differential in kicking efficiency, but in 2017 they are ranked first. This year they are ranked 16th for clearance differential, after being No.1 last season. Brisbane has struggled with its ball movement this season, and is ranked last for differential in all of kicking efficiency, inside 50s and time in forward half. Welcome to Etihad Stadium for the Western Bulldogs v Brisbane Lions Round 5 clash. 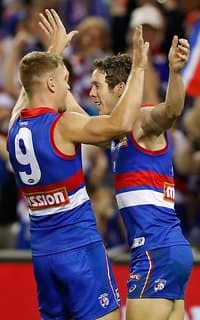 A GRITTY second-half comeback has saved Bob Murphy's 300th-game celebration, with the Western Bulldogs seeing off a brave Brisbane Lions' outfit by 32 points at Etihad Stadium on Saturday afternoon. The Dogs kicked 12 goals to two after the main break – including one from the milestone man himself – to win 17.20 (122) to 14.6 (90). It looked less like a fairytale and more like a nightmare for the premiers early on, with the Lions' startling accuracy in attack opening up a second-quarter lead of 38 points. In comparison, the Dogs couldn't hit the side of a barn before the main break. They had more than double the number of inside 50s to quarter time and 16 to five shots at goal, but moved the ball with a horrific kicking efficiency of just 13 per cent. The Lions couldn't miss. They had nine goals on the board before their first behind 21 minutes into the second, with Eric Hipwood nailing three before a corked leg reduced his input. The Dogs' defence had holes, with the Lions booting an astounding number of goals on the run after quick movement got the ball in behind the last line. Lewis Taylor was the spark, Dayne Beams and Dayne Zorko accumulated plenty of the ball while the lead was assembled, and Daniel McStay and Harris Andrews impressed in defence with Tom Boyd kept virtually out of the contest. 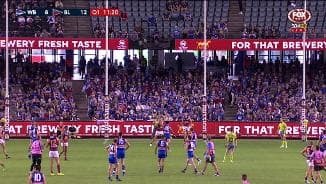 But all their precision and brave movement was cut down when the Dogs staged their second-half comeback, with Jack Macrae, Luke Dahlhaus and Liam Picken the main instigators in five unanswered goals. 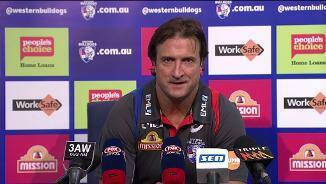 Bulldogs coach Luke Beveridge said while the comeback showed great "grit and integrity", the initial deficit exposed holes in their game when faced with opponents rebounding quickly after turnovers. "The great thing is they hung in there," Beveridge said. "Their self-belief and team belief is right there in the right part of the chart, and to turn it around by 60-odd points again is a great effort, but we don't want to be there. "We want to take control of games, and we're not doing that." The Lions still held a five-point lead going into the final term despite failing to score a major in the third. Tom Rockliff opened the fourth with a goal, but Josh Dunkley responded quickly despite his own injury concerns. 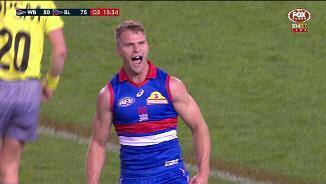 A 50m penalty to Dahlhaus after he marked and was dragged to the deck by Daniel Rich gave the Dogs their 12th goal with nine minutes left, and they inched a point in front. A midfield turnover then saw Murphy gather and slam the ball inside 50, which turned into a match-winning major to Dunkley with five minutes to go. 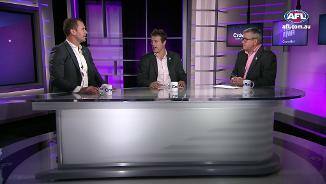 The floodgates then opened and the party started, with the premiers coasting to the line with four more majors. 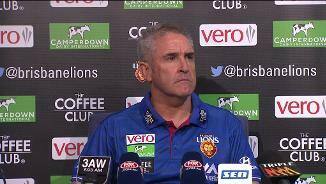 Brisbane Lions coach Chris Fagan said his team "did a lot right", but with six 19-year-olds in the side, understood fatigue became an issue. "We were off the back of a six-day turnaround, and the Doggies had a couple more days to get ready than what we did – perhaps that showed a little bit in the end," Fagan said. "That's not to take credit away from the Dogs. Their fightback was fantastic. "We understood that they would come back at us hard. We were still in front at the 16-minute mark of the last quarter … unfortunately the dam wall burst." Western Bulldogs: Josh Dunkley was brave to see the game out after injuring his left ankle and copping a bruising hit to his lower back. He was icing both injuries in the rooms afterwards, but the Dogs are confident neither is serious. Matthew Boyd had the back of his head sewn together after a heavy knock, but played out the game with what was sure to be a whopper of a headache. Brisbane Lions: Eric Hipwood hurt his left leg in the second quarter but finished the game, while Dayne Zorko suffered a poke in the eye and spent time on the bench, but recovered to be one of the Lions' best. The Bulldogs will play their first game in Canberra since 2014 when they take on Greater Western Sydney in the capital's inaugural Friday night game at UNSW Canberra Oval. Meanwhile, the Lions will host Port Adelaide at the Gabba on Saturday at twilight, after last beating them in 2015.